Built to guard the roman road from Brougham to Ravenglass, 1st century. Photograph, head of lake Windermere, by Herbert Bell, Ambleside, Westmorland, 1890s? Waterhead bay on the left; the roman fort site and Borrans Park left of centre. At the head of the lake [Windermere], and level with it, not far from Ambleside, is a Roman fort, single ditch, 396 feet by 240 the shortest side next the water, in which have been found Roman antiquities, though its name cannot be ascertained. At the upper corner of Windermere water, not far from the present town of Ambleside, lies the carcase of an antient city with large ruins of walls, and without the walls the rubbish of old buildings in many places: adjoining to which and opening to the water has been a fort of an oblong figure 165 by 100 yards, fortified with a ditch and rampart. Pieces of bricks, little urns, glass phials, Roman coins, round stones like mill-stones, of which soldered together they were wont to make pillars (for hypocausts, and the paved ways leading to it, are undeniable testimonies of its being a work of the Romans. And to this place Mr. Horsley supposes the military ways to have gone which pass by Pap castle and through Graystock park. This fort is guarded on the west by the conflux of the rivers Rowthey and Brathey, on the south by Windermere, a high rock at a small distance intercepted the north wind, and being fortified with a ditch and rampart it was only accessible from the south-east. Mr. Ward supposed the name of this station DICTIS, and removed AMBOGLANA to Burdoswald, it being placed by the Notitia ad lineam valli. Among other pieces of antiquity discovered in this fort, were several Roman coins in all metals, which make part of the cabinet given by deed 1674 by Mr. Thomas Brathwate to the university of Oxford, many of them found in Barran's ring, a square fort in this lordship. At the upper point of Winandermere lies the carcase as it were of an antient city with great ruins of walls and of buildings without the walls still remaining scattered about. It was of an oblong form defended by a fosse and vallum, in length 132 ells and in breadth 80. The British bricks, the mortar mixed with fragments of bricks, the small urns, glass vessels, Roman coins frequently found, round stone like mill-stones, of which piled on one another pillars were formerly made, and the paved roads leading to it plainly bespeak it a Roman work. Its antient name indeed is lost unless as it is at present called Ambleside any one should suppose it the AMBOGLANA of the Notitia. 20 engravings, Views of the Lakes in Cumberland and Westmorland, drawn by Joseph Farington, published by William Byrne, London, 1789. CAMBDEN says, "At the upper corner of Winandermere lieth the dead carcase of an ancient city, with great ruins of walls, and many heaps of rubbish, one from another, remaining of buildings without the walls, yet to be seen. The fortress thereof was somewhat long, fenced with a ditch and rampire, took up in length 132 ells, and breadth 80. That it has been the Romans work is evident by the British bricks, by the mortar tempered with little pieces of brick among it, by small earthen pots or pitchers, by small cruets or vials of glass, by pieces of Roman money oftentimes found, and by round stones as big as millstones or quernstones, of which laid and couched together they framed, in old times, their columns, and by the paved ways leading to it. Now the ancient name thereof is gone, unless a man would guess at it, and think it were that Amboglana, whereof the book of notices maketh mention, seeing at this day it is called Ambleside." By some stones found on Agricola's wall since Cambden's time, it appears Amboglana was there; the stones are now at Naworth Castle. The cohort might be first established at the Picts wall, and a part of them remove hither and give it their name; for Guthrie says, "under the Honourable the Duke of Britain was placed the prefect of a detachment of the Nervii called Dictenses at Ambleside." The fort lyes a little below the town; the remains of it are now very small, but many coins have been found there; and in the year 1785, a man planting potatoes with the spade there, found a crucifix of brass, which was given me. The inhabitants dug up, not many years ago, several pieces, (as they called them) of free stone, which probably had been altars or the pedestals of Pillars. As there is no free stone within twenty-five miles of the place, I should think they were brought hither for urns, fonts, or some purpose of that kind, as the blue ragg, or granite stones found here, cannot be worked with a chissel: Had any Antiquarian been there, some things perhaps might have led to a more perfect discovery, but they were generally broken small for scowring sand, which is a scarce article at Ambleside. That it was a Roman station is, I think, beyond a doubt: it is by the inhabitants called the Castle, and I should suppose that this castle or fort was of some account in the year 794, and was the place where the two sons of Elfwold were decoyed to before they were murdered, and not Bowness, as Cambden has conjectured: All the old authors agree that they were murdered at Winandermere, and I should suppose this was the only place of note in 794 within the parish called Winandermere. There was formerly a family of the name of Brathwaites here [Ambleside] ... 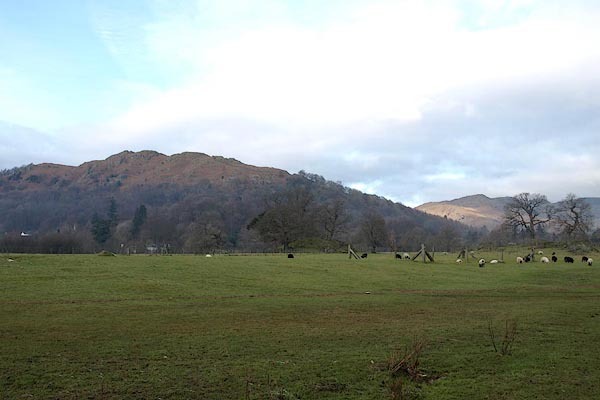 The last Thomas Brathwaite of Ambleside had a large collection of Roman coins, which he and his ancestors had got from the old fort (or castle,) and another place called the Borrans, a square fort, more remains of which may be seen than of the other. There were, says Mr Machel, who had seen those coins, "6 of gold, 66 of silver, and 250 others." He left them by his will to the University of Oxford; but his will being made void for want of form, (at the instigation of Brathwaite Otway) they continued in the family, and came into the possession of the Countess of Litchfield. Just at the head of Windermere, and a little short of Ambleside, turn down a bye-road to the left, and see the vestige of a Roman station. It lies in a meadow, on a level with the lake, and, as supposed, was called the Dictis, where a part of the cohort Nerviorum Dictenium was stationed. It is placed near the meetings of all the roads from Penrith, Keswick, Ravenglass, Furness, and Kendal, which it commanded, and was accessible only on one side. time in destroying the last remains of ancient magnificence! Roman coins and arms have been frequently found here; and, in forming the turnpike-road through Rydal, an urn was lately taken up, which contained ashes and other Roman remains, and serves to prove that the tract of the ancient road laid that way. National Trust. Remains of 2 Roman forts of different dates, with granaries etc. On splendid site in open field on lake edge, now a public open space. Print, uncoloured engraving, North East Gateway of the Station of Amboglana, 180s-90s? The roman fort at Ambleside, Westmorland, on the River Brathay. Guide book, Things Seen at the English Lakes, by William T Palmer, published by Seeley, Service and Co, 196 Shaftesbury Avenue, London, 1926. Galava -- Brathay, River -- Waterhead -- Ambleside -- Lakes -- Cumbria / -- Collingood's reconstruction of the fort. Galava -- Brathay, River -- Waterhead -- Ambleside -- Lakes -- Cumbria / -- Samian ware from the fort. Galava -- Brathay, River -- Waterhead -- Ambleside -- Lakes -- Cumbria / -- Gravestone excavated at Galava. To the good gods of the underworld / Flavius Fuscinus retired / from the Centurionship / Lived 55 years: / To the good gods of the underworld / Flavius Romanus, record clerk / lived for 35 years / Killed in the fort by the enemy.